30 pure electric buses were put into operation on the No. 20 bus rourtes in Haikou on 30th Dec, 2011, reports hainan.net. The bus route is the first pure electric bus route in Haikou, the capital city of Hainan province. The bus route runs between Diankun Residential Quarter and Nongken Middle School (甸昆小区—农垦中学). The route and ticket fare remain unchanged. The 20 pure electric buses uses dual-electric technology which features low emission and high efficiency. The pure electric bus can run 150-170km after the battery is recharged, which will be lowere the cost than an ordinary bus. 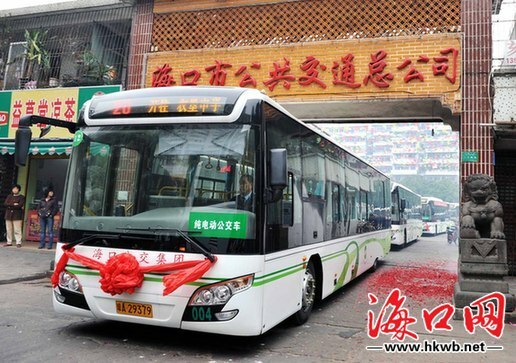 The Haikou city has put into use of 150 LNG-fueled buses, 50 gas-electric hybrid buses and 30 pure electric buses in 2011. The total number of buses has reached 1,242, among which the number of new energy buses reached 874, accounting for 70.4% of the total, and the ratio is expected to reach over 80% by the end of 2013.